This Whirlpool/Kenmore Dryer Lint Filter Screen (8557884) is a popular lint screen filter that slides in to top of the dryer. 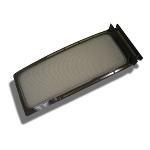 This lint filter is used with many newer model Whirlpool and Kenmore dryers. It will also fit many Kirkland Signature, Estate by Whirlpool, KitchenAid, Roper, Inglis, and other dryers made by Whirlpool which use a top loading lint screen filter of this size. 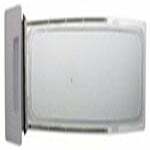 This lint screen includes a large white plastic handle attached to the top of it which also functions as a lid. The approximate measurements of this Whirlpool 8557884 lint screen is 17 1/2" length (not including handle), 7 1/2" at screen, and 8 3/4" width of handle. Including the white handle it is about 21" long. In addition to reducing your energy bill, periodic replacement of the dryer lint filter will help to extend the lifespan of your appliance. 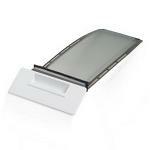 This is a genuine Whirlpool dryer lint screen filter replacement. It is a compatible replacement for the following dryer lint filters: 689471, 689469, 696021, 348855, 341256, 696022, 348858, and others.